love; home life and rural life. Wow, sixteen years ago. I sound like me, and not like me at the same time. A very big difference is that now I am just a bit younger than Gladys was when she wrote this. I look at the photo on the back, and can't believe I look that old to younger people, but I know I do. 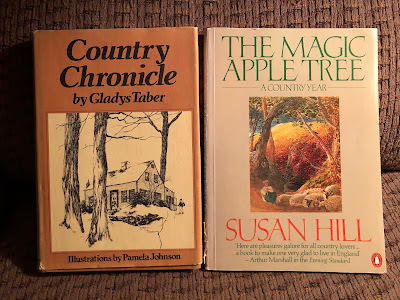 As I've mentioned, Gladys in this book is just about Susan Hill's age in Jacob's Room is Full of Books, but I found a great difference between them. Gladys seems like an elderly lady whereas Susan doesn't at all. 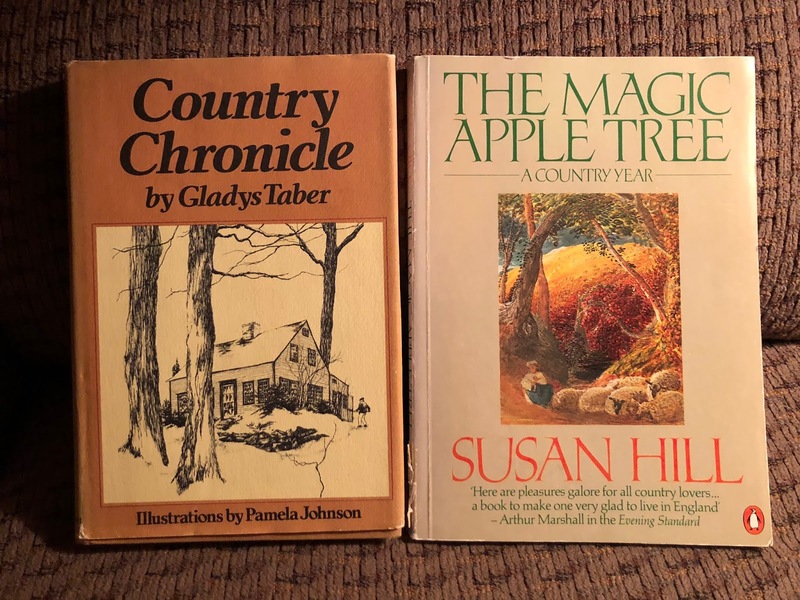 If I were to read these two books without knowing the age of the authors I am quite sure I would think Gladys is considerably older than Susan. Isn't that odd? I can't point to any specific examples, but it was quite striking to me. Gladys lives alone in this book. Her friend Eleanor had died in 1960. Her children and Gladys' have all grown. Yet, she remains cheerful and hopeful. She feeds wild animals - skunks and cats! She lives a full life, with helpers. There are people at both her homes, Stillmeadow in Connecticut, and Still Cove on Cape Cod, who work for her. I suspect they helped make it possible for her to remain in the places she loved. Her descriptions of winter are incredibly lovely and poetic. And her wisdom always makes me stop and think and wonder. We live in a world of noise and confusion, and a good many scientists agree that man suffers from it. We are bombarded with noise from jet planes to riveting machines, from subways to sirens. And I think, as I feel the healing of the winter-morning stillness, that we all desperately need some quietude in our lives. I notice how we scream at parties and shout at meetings and what a tendency the young have to toss bombs and smash windows, and I wonder whether part of this isn't a reaction to frayed nerves. Winter means work; there is no arguing around that. Nature does not make it easy. Snow shoveling, plowing the road, thawing the car out, getting in firewood, cleaning the ashes from the hearth, filling the bird feeders - and always and forever mopping up melted snow, thawing frozen pipes, feeding stray barn cats - all of this would be alien to a tropical inhabitant. But mankind, whatever else one may say, has the ability to adapt and manage, whatever the climate involves. Successful living, I suspect, depends on how willingly we do adapt to the environment. New Englanders adapt, which is one reason life here is so pleasant. When it is 20 or 30 degrees below zero, Art Olsen, the plumber, may come out at night to get the furnace going again. His boots will have a glaze of ice from the preceding emergency call. His face is ruddy with the cold, making his sea-blue-eyes startling intense. "How dreadful to have to come out on such a night," I may say. The typical Yankee answer comes firmly: "We got to expect it this time of year." Or sometimes, "Well, I don't care for the tropics myself. Too hot, too many bugs." Or "This snow is good for the ground. Nature knows what it's all about." Or "We take what we get. Spring's coming in time." I know that was a lot to quote, but isn't it all just so wonderful?! And if there's one thing I would say is different now is the "typical Yankee answer." So many people around me complain, complain, complain about the winter. If they have the money, they travel south. If they don't, well, you'd think they didn't know what to expect in the winter. I don't remember people thinking so much about the weather. They talked about it, of course, but they didn't get so upset about it. The weather reports on radio, television, and internet make one feel like the winter apocalypse is upon us, when those practical among us, those who remember that winter is most always the same - cold, snow, ice, rain, melt, wind, repeat - just shake our heads thinking these weather people have a really short attention span. I have said that I love winter, and the only thing that upsets me is if my kids are on the road in bad weather. This year there seems to have been snow and/or rain and/or ice every few days. And I've worried. Not fun. We had tickets to see Jim Gaffigan again, this time much closer and not at a casino like last year, but we opted not to go because the snow was going to start just as the show ended and we'd be in it all the way home. Matthew, Margaret, and Hazel traveled two hours to a Disney on Ice show, and had to spend the night because of a storm, and still had to drive home the next day in iffy conditions. Estée had to pick up her parents from the airport, and the weather was awful. Both my kids and their spouses have had to go to work in bad weather. Other than this worrying mother, most of us are like Gladys' plumber and we just get on with it. We have studded snow tires, and brave whatever the winter brings. Most of us, I thought, are caged in some way all our lives. There are walls and bars and fences of all kinds, invisible but tangible. We spend a great deal of time climbing over obstacles - perhaps this is what life is all about. But we must all, I think, long for a brief time of real freedom outside the restrictions of our existence. A time, for instance, when we would toss all the clocks out of the window, take the telephone off the hook, let the doorbell ring all by itself. Now more than ever, I think. Gladys tells a story I hadn't heard because I've not read any of her Cape Cod books. One year they went on vacation for the first time in ages. But the ocean was there and the marshes and sand dunes, and sea gulls flew over all day. Jill (the fictional name of Eleanor) went off the next morning. ... "I have bought us a piece of land on Mill Pond around the corner." ... "We'll be coming back and we'll be comfortable." I've often wondered - if we had rented a good modern cottage, would we have ever had Still Cove? In any case, she was wise, as she invariably was, for after the children married and had their own children, we spent more and more time on the Cape while they took turns at Stillmeadow during vacation times. I was so very happy to read this. I must read some of her books about Still Cove. I was there as a small child but have never gone back. I read horror stories of the traffic and it just doesn't appeal to me. One of my favorite old songs is about Cape Cod. It is so evocative of place, and makes me yearn for something that is long gone. Perhaps the one universal solace for anyone, anytime, anywhere is being able to blame something on somebody for the sorry state of the world we find around us. Today's young people want to blame the older generation or the government, and the older folk find some ease in blaming the young. There must always be a scapegoat, and this evidently goes back to Biblical times. I notice men will do anything except ever, ever blame themselves. As the Talking Heads sang, "same as it ever was." Addendum: I don't know what is up with the fonts, but they are weird again. Having read this wonderful post I think I shall have to read something by Gladys Taber now. I rather fancy Connecticut... what would you recommend, Nan? The one you're talking about here, Country Chronicle, or something else? I do hope you're enjoying The Magic Apple Tree. I plan to write about "Susan's winter" soon! This was quite enjoyable to read, Nan. I understand your worry about your kids being on the road in the bad weather. Even though you guys are used to those things - unlike us - there's always the 'other guy' and not being able to trust what they are doing. Texting on their phone? Likely. The weather people are quite funny these days. I keep thinking that it must be that they have more time to fill or maybe it's just the expectation that if they don't warn people constantly, no one will know what to do. We get the same thing here when there is even a sprinkle. Be afraid, be afraid, it's slick out there. I want to say 'it's spring in Texas and there will always be rain and thunderstorms and even tornadoes'. It is ever thus. As to the warnings and the fact that each storm is 'historic', I remember my grandmothers talking about weather in the Texas Panhandle in the 30's and 40's and 50's. Yeah, it's happened before. Ha! I just can't imagine texting and driving. I can barely text when I'm doing nothing else! You are absolutely right about the weather people! They get everyone all shook up. 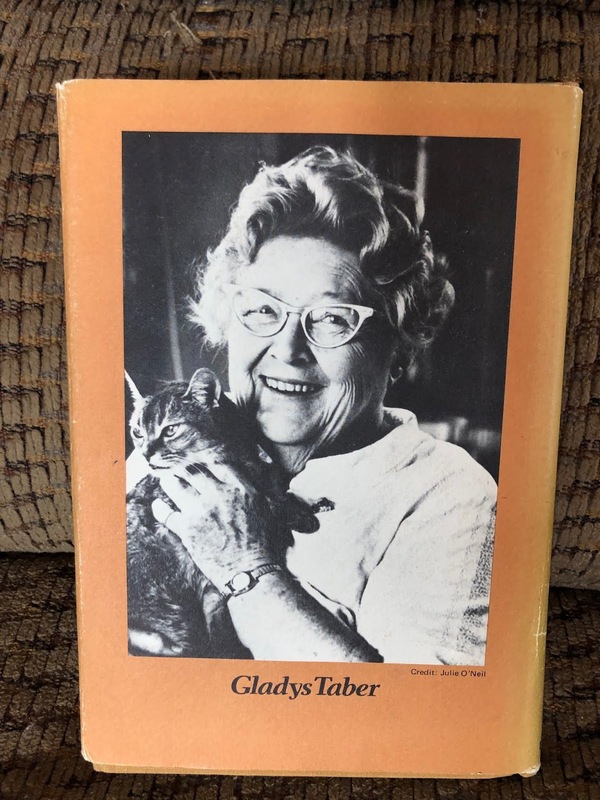 "Historic"
Thank you for another timely reminder of Gladys Tabor's work. 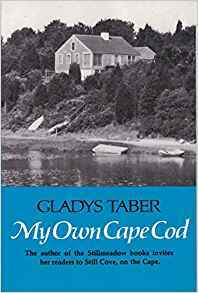 I love the excerpt, and as usual, Tabor's writing calms me and makes me appreciate anew the healing power of nature. Reading Tabor's combination of common sense and beautiful prose is a treat. And I thank you for your perfect description of her work! "we all desperately need some quietude in our lives.' I would add that some of us 'unravel' rather quickly without it! Having always lived in rural areas [other than 3 years in a New England college town] I'm atuned to the sounds of nature--I suppose that mentally I'm always describing the sound of the wind, trying to identify the bird that is calling just out of sight, waking to hear rain begin deep in the night. The late nature writer, Edwin Way Teale, wrote of those he called 'the noise needers'--I think it was the era when 'boom boxes' were popular. By the way: in Rosamunde Pilcher's novel, Winter Solstice, when the church organist falls ill before the midnight Christmas service, a 'ghetto blaster' is hastily brought in to provide carols! "Unravel" is a good way to describe it! Even too much conversation can cause it! Introvert, all the way. I do love Mr Teale's words. I had forgotten that in WS. Very funny. Thanks for your thoughts. Thanks for the introduction to two interesting wordsmiths. I shall try them. Have you ever read Gladys Taber? You are so right about our obsession with the weather. It is contagious. I find the weather forecast affecting my decisions about what I will do to an absurd extent considering the generally congenial weather outside. But storms, flooding, gales and drought are flagged up in such an excited and doom-laden way that it is hard to ignore the warnings. Mind you, the other day I did get drenched to the skin going up to town and was horribly uncomfortable for the rest of the day. But it wasn't exactly life-threatening. I don't even listen unless my kids have to be out in it. I'm the kind of weather person who looks out the window to see what the weather is! Sorry you got caught in the rain! I have the song playing while reading this, it's one of my very favorite songs in the world and always made me wish to visit. I realize that the Cape Cod of the 50s and Gladys's time probably don't exist anymore. Nan, this is one of the few Taber books I don't have and I really must see if any are available at a reasonable cost. Just reading your post makes me want to read the whole book. I have the slim book she wrote after Jill died (I guess I'll always think of her as Jill) and I do have My Own Cape Cod but not the other one. She makes Cape Cod sound almost as special as her own village. I'm trying to remember, does she say the name of her street? The name Jeremy Swamp Rd. is in my mind. I love the old Yankee responses! She did such a wonderful job in all her books of showing respect and love of the people in her town. Now to go see if Country Chronicle is available! I think that is the name! I love what you wrote about showing respect and love. No patronizing, or looking down on them. It was so wonderful, and so like her. I thank you for your long, thoughtful comments. Old Cape Cod is one of my favorites, too. It makes me nostalgic, and the words themselves are nostalgic. Amazon's copies were expensive but I found Country Chronicle at AbeBooks! So excited to have found one, can't wait to read it!